Over recent years, there have been many advancements in the world of technology. This not just in terms of devices such as smartphones and tablets but also when it comes to home entertainment such as TVs. Many of us will remember the big CRT TVs that took up so much room because of their bulk. Well, these days we have sleek, flat-screen TVs that take up very little room in terms of their depth and can even be mounted on walls. Not only that, but some manufacturers have taken things a step further when it comes to TV technology. For instance, tech giants Samsung and LG were the first to launch curved OLED screens. In this article, I will talk about this new technology, the TV market, and the position of some of the big shots within the industry. What is OLED technology all about? Advancements in TV technology, such as smart TVs from the likes of Apple, have improved our entertainment experience over recent years. In addition, many people became used to the advancements in screen technology such as plasma and LED (light emitting diode). The latter, in particular, have become very popular over recent years. However, when these tech giants introduced OLED technology, it quickly became the main rival for LED screens. Of course, the technology is still new and many people will still be reluctant to trade in their LED TV if it is in good working order. However, for those who are on the market for a new TV, one decision they will have to make is whether to go for LED or OLED. So, what are the benefits of OLED technology when it comes to TVs? Well, it stands for organic light emitting diode and this is because they use an organic technology that lights up when electricity is fed through. While you may think that LED screens are very thin, TVs made with OLED have the ability to be much thinner. This has given manufacturers such as Samsung and LG the ability to create this new breed of OLED curved screen TVs, which can provide you with an immersive viewing experience. What are the benefits of having a curved TV? A more immersive experience: When you have a curved OLED TV, you can look forward to a more immersive experience when it comes to your viewing. The idea behind this technology is that the picture wraps around you and puts you in the center of the action. It is able to better penetrate your peripheral vision to improve your viewing experience. A 3D experience: When watching a curved OLED TV, there are many that claim that it manages to make 2D programming look like 3D when it is being viewed. This is because it gives the viewer more depth due to the curvature of the image that the viewer is seeing. Improved field of view: The curved design of these TVs means that you can look forward to an improved field of view. Viewers get to enjoy the feeling of a wider field of view than they would get with a standard flat screen TV. This helps to create that immersive experience. Better contrast levels: When you watch a curved TV, you will enjoy better contrast levels than you would with a flat screen TV. This makes for a more enjoyable viewing experience. The design manages to improve contrast by directing light from the screen directly at the eyes. You can enjoy increased sharpness and a superior overall entertainment experience. Better design: When you opt for a curved OLED TV, you can benefit from better design. This is not due to the curved design but because of the OLED technology. This does not require the use of a backlight in the TV, which means that you can enjoy a far lighter, slimmer design even compared to today’s LCD flat screen TVs. You can now get special stands that are designed for curved TVs too, so placement in your living room shouldn’t be a problem. Picture quality: With OLED technology, you can enjoy far superior picture quality, so you can make the most of your viewing experience. You get to enjoy total black as well as stronger contrast ratios from this technology. This makes for a far better entertainment experience when watching your favorite shows and movies. These are just some of the key benefits that come from the use of OLED technology as well as from curved TVs. When you opt for a TV that is both curved and uses OLED technology, such as those that have been launched by Samsung and LG, you can look forward to a viewing experience like no other. As mentioned earlier, Samsung and LG were the first to launch this innovative TV technology, and leaders in the tech market they stirred up a lot of interest. Inevitably, this meant that other TV tech giants and companies were going to want to get in on the action, which is exactly what happened. There are now a number of different manufacturers, including some budget ones, that offer curved OLED TVs. As with all technology, this type of technology tends to be very expensive, to begin with, as these tech giants have invested millions of dollars in order to bring the technology to market. 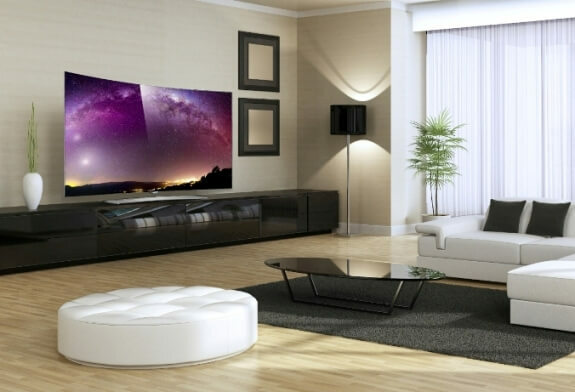 However, as time goes on, the cost of purchasing these TVs will continue to come down, which could result in increased popularity amongst consumers who are looking to purchase a new set.